Cranberries are a coveted, must-have ingredient during the holidays, and fresh cranberries are only available in the fall and winter. These brightly colored berries make a delicious rice pilaf, stuffing, and of course, incredible baked goods. But cranberries’ bright, cheerful color and incredible sweet-sour taste do much more than just appeal to our senses… cranberries are also packed with detox properties that make them worth enjoying all year round! Cranberries are an excellent choice if you want to lose weight and lower your blood sugar. Why? Because unlike other common berries, cranberries are lower in sugar (fructose and sucrose). Fresh cranberries only have two grams of sugar and 40 calories per cup, and they are packed with fiber and antioxidants. Dried cranberries, however, are often packed with added sugars, oils and preservatives. It’s best to enjoy your cranberries fresh or frozen to obtain the most benefits, and always buy organic since berries are commonly sprayed with pesticides. Let’s take a look at five reasons to add more cranberries to your diet. One of the most unique properties of cranberries is their ability to protect the body from a form of stomach bacteria called Helicobacter pylori. This bacteria has been linked to digestive problems, allergies, and chronic yeast infections. Eating cranberries has been shown to kill these bad bacteria and support overall immunity in the gut to protect the body. Cranberries’ fiber and low sugar content also support the body when candida (yeast overgrowth) is present. Because of the way cranberries fight bacteria, they will not feed yeast in the body, which other fruits that are higher in sugar may do. Cranberries can also aid in removing waste from the body that can cause constipation and poor digestion. Cranberries are so effective in reducing bacteria in the body that they even help fight tooth decay! Cranberries support detoxification of the kidneys, which is why they are so well known for treating bladder infections and supporting urinary health. They help stimulate urine flow and also remove harmful bacteria from the kidneys that can lead to infection. As a result, they support the removal of excess water and can help you lose water weight naturally, unlike harmful diuretics that can contribute to the loss of crucial vitamins and minerals. Removing excess water weight is also important for improving your energy and making you feel less bloated. Cranberries are a great source of vitamin C, which supports detoxification by protecting and improving immunity. Vitamin C also stimulates the digestive tract to help with the removal of waste. This can help fight constipation and support the body’s defense mechanisms. Vitamin C also improves the uptake of iron in the body to assist with overall health. Lastly, vitamin C supports liver function and detoxification by improving enzyme functions that aid in the removal of toxins. Cranberries are fantastic for fighting constipation since they are high in fiber, vitamin C and potassium. Each of these support digestive flow, preventing the stagnation of waste in the body that can lead to sluggishness and lack of bowel movements. The fiber in cranberries also stimulates the formation of good bacteria known as probiotics; good bacteria feast on fiber and fight bad bacteria such as yeasts and fungi. All berries are great for fighting constipation, but if you’re sensitive to fructose, cranberries are a good option since they are one of the lowest in sugar. Cranberries are also packed with polyphenols, which are antioxidants that give the berries their bright and beautiful color. These help to fight off free radicals in the body that lead to toxicity and many forms of disease. Simply filling up your diet with antioxidant-rich foods will support overall detoxification and may even help you fight off cravings for unhealthy foods because the body is getting what it needs most at a cellular level. Other foods high in polyphenols include dark chocolate, beans and other berries. Cranberries should be a part of everyone’s diet, especially in the fall and winter months when the body’s defenses may need some help. You can add them to smoothies, oatmeal or quinoa porridge. You can bake with them or use them in wild rice pilafs. What are some other ways you enjoy using cranberries, and have you ever used them for health purposes? Hey Buddy!, I found this information for you: "Ways to Use Cranberries to Detox Your Body Naturally". 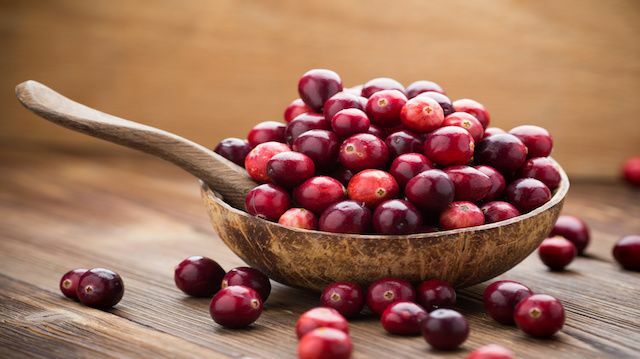 Here is the website link: https://www.thealternativedaily.com/cranberries-detox-your-body-naturally/. Thank you.